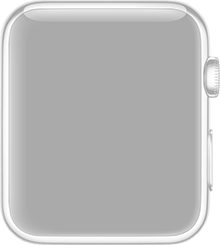 We are pleased and excited to announce the first art community and marketplace for the Apple Watch, by Bluebird Art! Bluebird Art is all about helping you connect with top professional artists and their creative process. Now, you can get "tapped" when an artist you follow starts, finishes, and shares a work to the Bluebird gallery - and see the latest works - all from the convenience of your wrist! We at Bluebird are tremendously excited by the possibilities of intersecting technology with art, and we are smitten by the opportunities presented by the Apple Watch in bringing you closer to artists and the work they're making on a daily basis. Download the Bluebird Art App + Watch App here. We're sharing artist and collector features, new artworks and creative processes, announcements and more on Facebook and Instagram. Today we're sharing the creative process of one of Bluebird Art's favorite projects, McClure Pass Diptych, by artist Sirima Sataman. 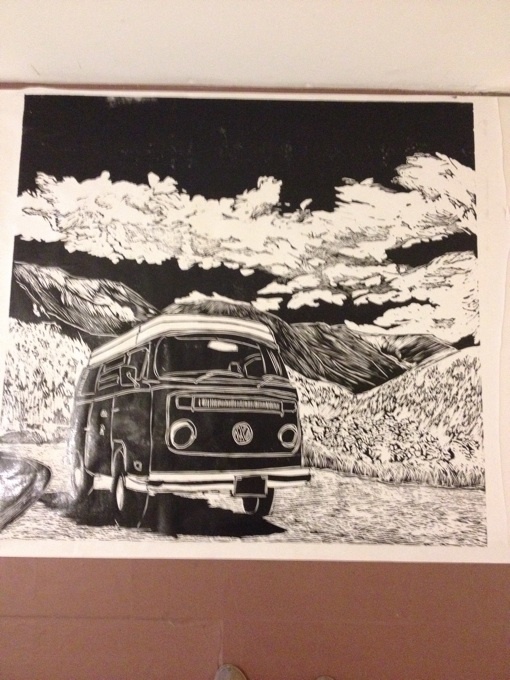 Sirima took her beloved VW bus to that high pass in Colorado, where this work draws its inspiration. 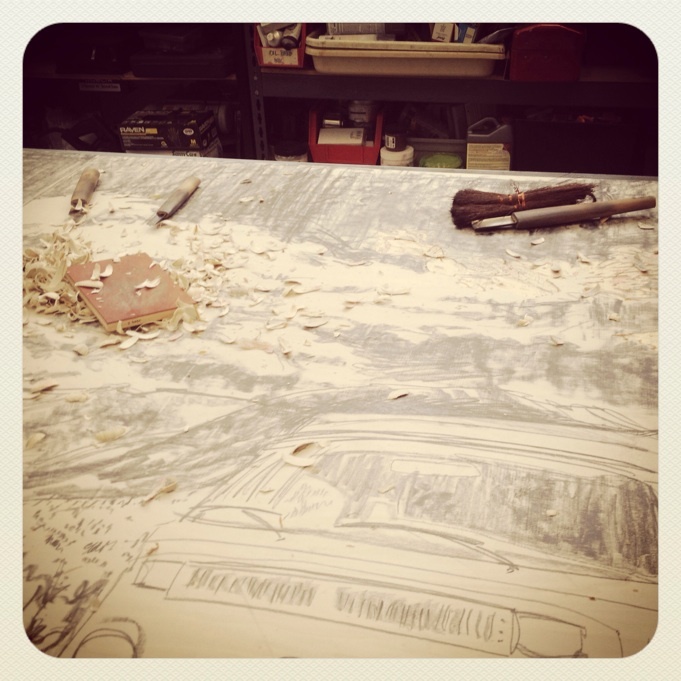 Drawings are made on wooden panels which are then carved, inked, and proofed. 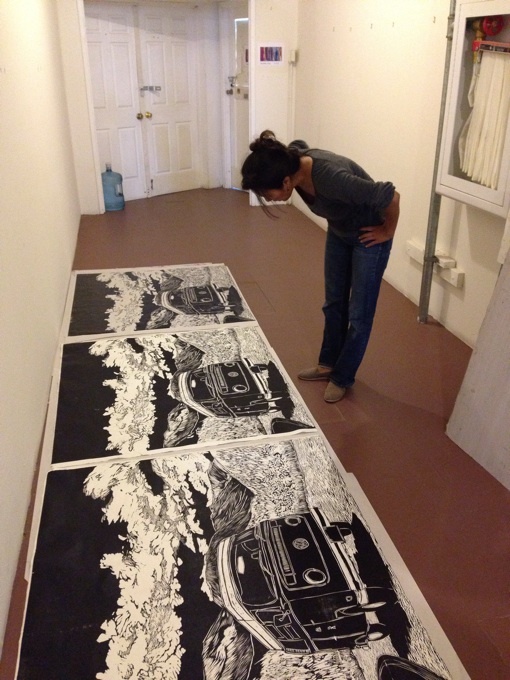 The prints for the diptych are then meticulously pulled from the woodcut. Pretty rad. 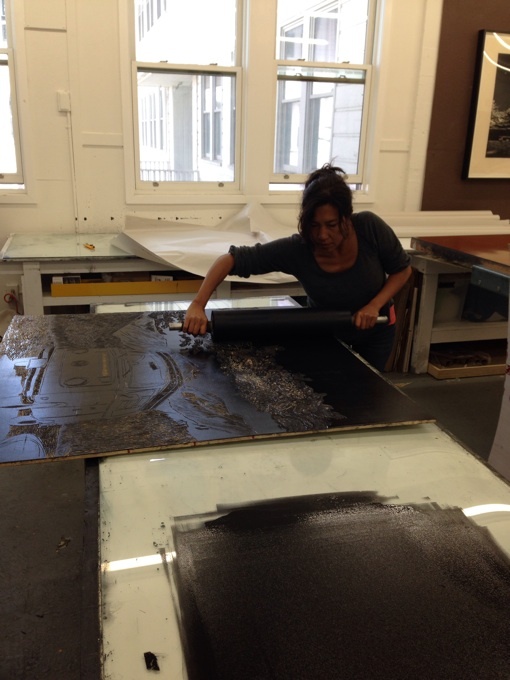 You can follow Sirima as she makes new works or purchase McClure Pass Diptych in the Bluebird Art app. 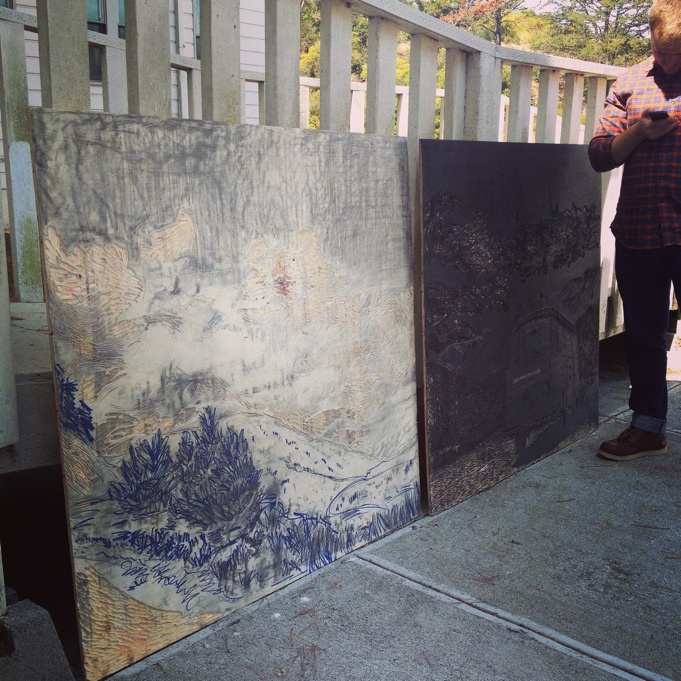 We're excited to feature Oakland-based artist, Peter Foucault. 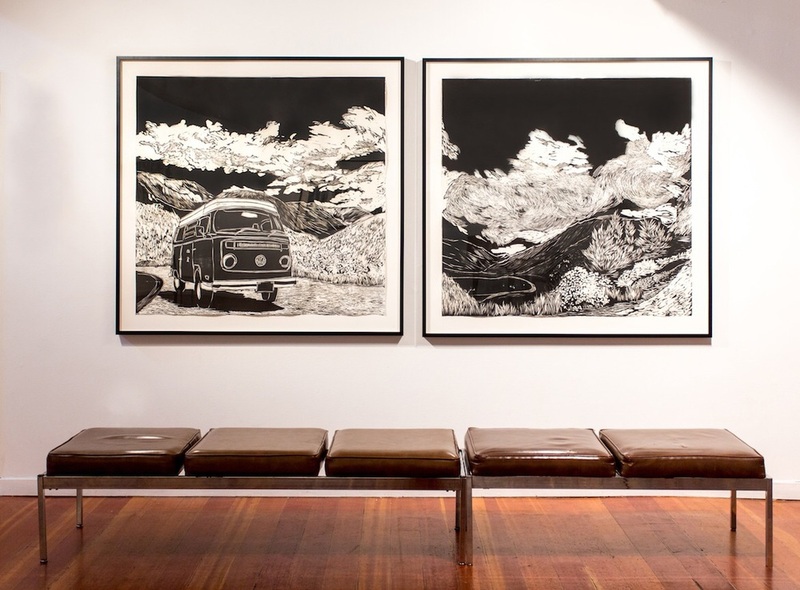 Peter creates works on paper that are fueled by his love of drawing and mark making. In his latest series of works, he created and employed a sound-activated robot that “paints” ink-based drawings based on the perception of sound in its environment. We're turning the tables this week and featuring one of Bluebird Art's first collectors and the host of our recent art show, Ms. Nancy Reyering. We asked Nancy, why is art important to you? She responded: "Art speaks through the eyes first, but then starts to live in the heart. Art reminds me of places I’ve been or aspire to, both physically and emotionally." 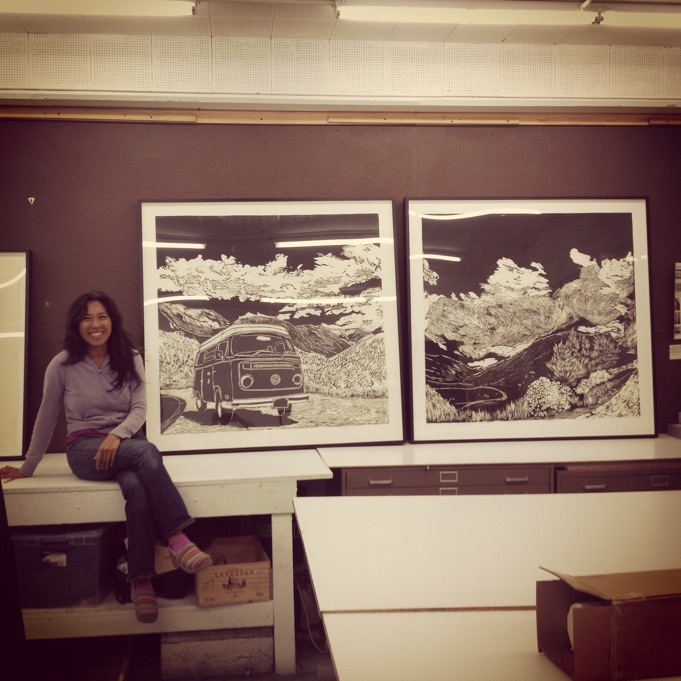 Read her interview and browse through the art show and her personal collection here. We are excited to announce a Bluebird Art show with collector and long-time Woodside, CA resident Nancy Reyering. Nancy was gracious to turn her beautiful Provence-influenced home into a gallery for local Bay Area artists for the month of April. Artists represented include Kit Colman, Renee DeCarlo Johnson, Courtney Stock, and Peter Foucault. All works from the show are available for purchase in the Bluebird Art app. Photography by Nathan Lewis. Tap here to see all photos from the show. We at Bluebird Art were given the fantastic opportunity to get an insider’s view into the life and work of artist Holly Savas at her residence and studio in San Francisco. The interview features Holly both as an artist and as a collector. Tap here for the interview. 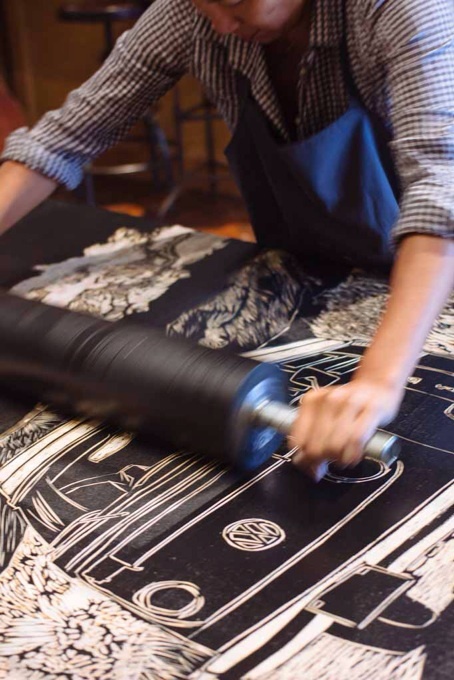 We are excited to be sharing interviews of artists we work with on Bluebird Art. Our first artist is no stranger to Bluebird: Christian Davies. His paintings are inspired by the American quilt patterns that he grew up around with his mother being a quilter. Tap here for the interview. Bluebird Art’s mission is to enrich people’s lives by deepening their understanding of art and bringing more art into their homes. I made Bluebird because I believe everyone should have an opportunity to understand, appreciate, and buy art. I'm excited to share with you the beginning of a new chapter for Bluebird Art: a mobile marketplace that'll help you enjoy, understand, and now - purchase - original art directly from the app. Download the new Bluebird App here. We are excited to announce a Bluebird Art show in Google's headquarters in Mountain View, CA, featuring artist Christian Davies. His solo exhibition, "I'll Never Know" is on view from Feb 6 through Mar 6, 2015. You can see the creative process of making for these works, and purchase them, in the Bluebird Art app. Photography by Calista Chandler. Tap here to see all photos of the show. We are excited to announce our first art show with one of San Francisco's most revered residential real estate agents, Wendy Storch. Over 100 guests enjoyed a joyous evening of art, architecture, and good company in a Modernist home in San Francisco with award-winning architecture. 12 artists represented by Bluebird Art showcased their works. Numerous works were sold to happy owners that evening. Photography by Nina Menconi Photography. Tap here to see all photos of the evening. In partnership with the San Francisco Museum of Craft and Design, I'm excited to announce the Bluebird Art iPhone app! Download the app here. Bluebird Art is the mobile platform for finding beautiful, one-of-a-kind pieces for your home by following the artist’s journey of making. Bluebird Art’s mission is to enrich people’s lives by deepening their understanding of art and bringing more art into their homes. I made Bluebird because I believe everyone should have an opportunity to understand, appreciate, and buy art. By engaging with the artist’s creative process, I believe we can find works that we can really connect with. Use Bluebird Art to follow painters, ceramicists, glass makers, wood artists, furniture makers, and others as they make beautiful works that you can own.